The June 24, 2005, UFO incidents over Mexico continue causing surprises and concern. During the course of this investigation, a new sighting has just surfaced - but this time a bizarre and disturbing one in nature. The incident took place in Mexico city a week before...and this is the story. On Friday June 17, Horacio Roquet left his apartment in Unidad Habitacional Lomas de Platero, Mexico City at 7:00 am ready to go to work when something strange attracted his attention. The morning was clear and Horacio noticed a dark suspicious object just above the front building's roof - not moving but static and looking like if it was floating. Horacio got a bad feeling about this strange presence at such a low altitude. Because this dark object looked intriguing to him, he stopped and tried to make a better visual recognition. And that's when he realized the object was an actual body, very weirdly-shaped and 'standing' just above the building's roof in a threatening position. Horacio's first reaction was to go inside his home and grab his videocamera, so he ran inside shouting to his sister to come outside with him to see this bizarre thing over the building. Both of them went outside and the "Thing" was still there, floating just a few feet above the front building's roof and Horacio's sister reacted by saying "What is that?" Horacio immediately began taping the 'thing' with his video camera. When Horacio applied the camera's zoom and got a closer look through the viewfinder he recevied a major surprise which left a profound impression on him. 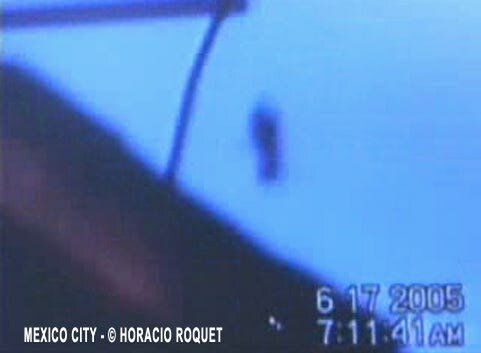 Horacio Roquet: "It looked like a human-shaped body, 'standing' vertical and just floating over the roof. I was shocked. The figure was not facing me...I was looking straght at its right side. It was tall. No sound was heard and we both stood still, watching, while I continued recording." "Then the dark body started moving to the right slowly, and rose several feet in the sky and then hovered again, completely still. I kept recording all the time. I was very nervious trying to control myself and I taped the thing the best I could." "After several minutes the dark figure moved again to the left, disappearing behind the building's roof. The sighting lasted about ten minutes. I don't have any clue what this weird thing was. At the end, my sister said, "That was odd!!" There have been other cases in the past where flying humanoid entities have been witnessed in Mexico. In January 16, 2004, a police officer from Guadalupe, N.L. was attacked by a mysterious flying being while on routine patrol in his police car in the Colonia Valles de la Silla neighborhood. The time was 3:15 AM and the dramatic incident caused a complete police mobilization and a serious commotion among the neighbors. 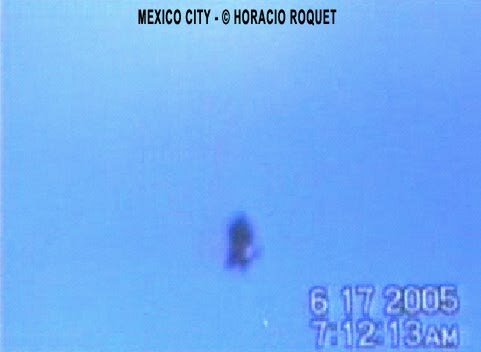 A month later, in February 14, 2004, Ana Luisa Cid along with two more witnesses videotaped in Mexico City a rare sighting of three flying entities interacting among each other and performing strange manoeuvers while in the same spot in the sky. The three dark beings seemed joined together...and then they separated. The big entity remained floating in the same spot, waving what seemed to be a huge cloak while above a kind of winged entity seemed to be vibrating itself. During this sequence, a small dark entity arrived and was 'absorbed' by the big one. Some minutes later, it was released and left the spot flying to the right. This incident known as "The Entity Reunion in the Sky" remains as one of the most bizarre and disconcerting sightings that we have seen. In March 5, 2000, Salvador Guerrero - a respected skywatcher - videotaped for several minutes a dark humanoid shaped entity over his neighborhood in Colonia Agricola Oriental in Mexico City. The humanoid entity was stationary in the sky, spinning on its axis, and you could see very well arms and legs. Then it moved, dissapearing behind some buildings. 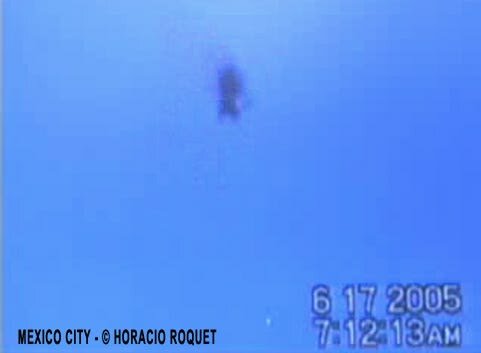 More weird sightings like this one followed in 2002, 2003 and 2004 in Mexico City and Cuernavaca where other respected skywatchers videotaped these absolutely bizarre humanoid figures in the sky. 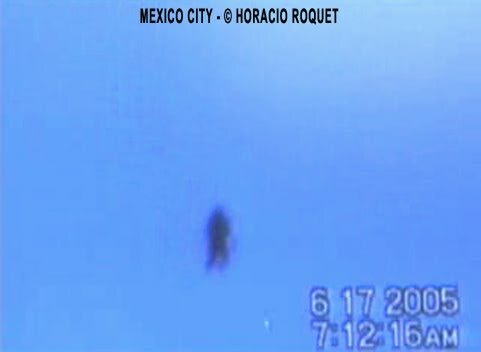 These types of flying humanoid entitiy cases from Mexico have been the subject of a permanent investigation studying each case separately, analyzing the witness testimonials, and the videos provided. Due to the complex nature of this particular phenomena we still haven't been able to establish any plausible theory to explain or understand the whereabouts of these 'people' in the sky. The cases remain an absolute mystery. During my phone conversation with Horacio Roquet I asked how he felt about his experience and he said: "It was disturbing."